When I was pregnant with my first baby, the doctor noted (with some alarm) that, for some reason, I wasn't vaccinated for rubella. Getting the shot while you're pregnant can carry risks, so he marked my chart with all sorts of red pen arrow scribbles and neon yellow highlighter to GET VACCINATED IMMEDIATELY FOLLOWING BIRTH. "Until then," he advised, only half joking, "steer clear of any polka-dotted children." As if you need another thing to worry about when you're carrying your first baby, right? Note: This is a photo of me during my third pregnancy. There are exactly zero photos of me during my first two pregnancies, because this is what I look like when I'm pregnant and I was obviously far too large and tired to go find a camera until my third try. I can't remember for sure, but I bet I had nightmares at least once a week about being surrounded by sick, bumpy kids, floating on a giant raft of NOPE through a sea of rubella germs. Of course, outside my weird pregnancy dreams, the odds were low I'd really come in contact with someone who was infected...but the price to pay if you are exposed to the disease while incubating your baby (birth defects, miscarriage, brain damage, etc.) are enough to keep you up at night, anyway. You'd do anything to keep your kids safe, and that starts before they're born. I didn't end up having to avoid any "polka-dotted children" during that pregnancy, but make no mistake — I would have skipped a birthday party for the Queen herself in a heartbeat if she'd so much as had the sniffles. Because hey, you just don't take a chance on your baby's health. If there's something you can actively do to reduce the risk of them getting sick, you do it. Plus, frankly, I don't want to catch the sniffles either, even if they're some kind of fancy royal variety. So when my son was born, tiny and vulnerable and thirteen weeks premature, I did everything in my power to protect him. I enforced hand washing rules until most of my family members barely had any skin left up to their elbows. For the first few months, I didn't take him out to the mall or a kindergarten classroom or anyplace else that tends to be filled with people who might carelessly cough in his general direction. And yup, I made sure he got every vaccine under the sun as soon as he was medically able to get them. 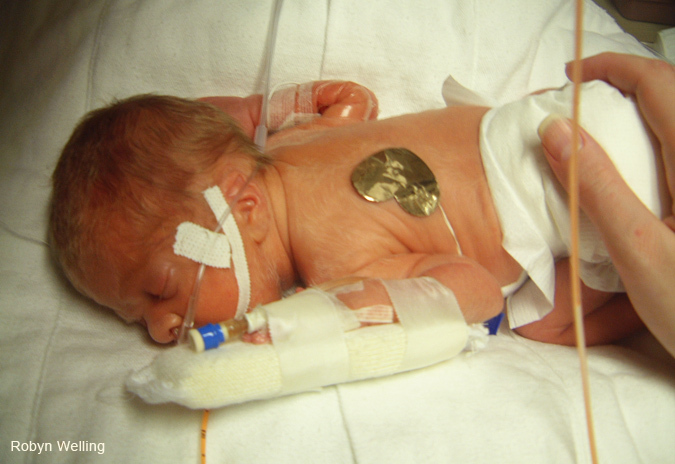 Here he is at 2 1/2 weeks old; he'd graduated from wearing surgical masks on his buns to actual preemie diapers, but his arm was still about the size of my thumb. Of course now he's fifteen and taller than me, but that's a different sad story! For me, vaccinations are just another way to protect my kids' health and safety, the same way I protect them from germs by teaching them proper bathroom hand-washing hygiene, or protect them from danger by telling them they can't have a rattlesnake as a pet. I mean, is there a chance they could have a pet rattlesnake and never get bitten? Sure. But parenting is all about weighing risk versus benefit—and preventable disease, like a venomous rattler bite, is something I'm not willing to risk my kids going through. Not if I can help it. Luckily vaccines are basically 100% benefit with none of the risk, because they're safe...safer even, I'd wager, than the surface of my kids' (probably unwashed) bathroom hands. This post was written in partnership with I Vaccinate, but all belief in medical science and junk is my own. I don't write about stuff like this very often, but when I found out that my state has one of the worst childhood and overall vaccination rates in the nation (only 54% of toddlers here are up to date on their shots, believe it or not) I wanted to speak up about how important I believe it is. Check out I Vaccinate for more details and facts, and then make sure your kids are covered (not to mention yourselves, parents—that rubella is no joke).